Join us this week as we welcome the rock band, Blindside Drop. 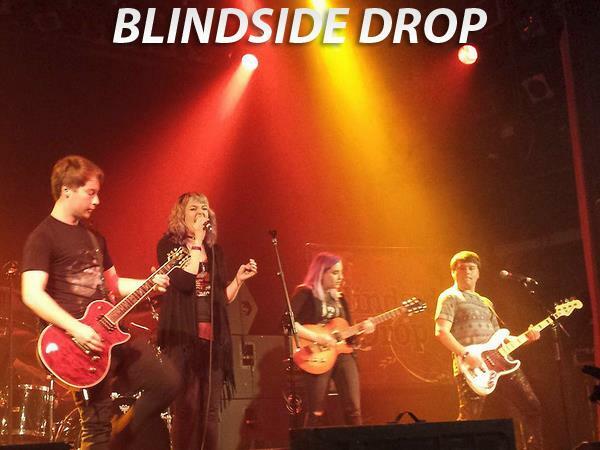 Blindside Drop is a Hard Rock Alternative band from Winchester, Kentucky. With chaos and composure, they burst out song after song fusing alternative and pop stylings with classic metal into a cyclone of eerie high-octane fueled free-spiritedness. The vocals conquers the bellowing music with compassionate lyrics and Gothic mystique while intensified by the surging musical embrace. Originally formed by guitarists Mark Wolf and Stefany Moran, the band blossomed when Brittany Means joined and galvanized their chugging crystalline guitar riffs and melodies with her dense ambiance. They recruited bombastic drummer Ryan Profitt and slapdash bassist Michael Wolf to animate their sound. They have played notable venues like the Hard Rock Cafe in Louisville, KY, the Foundry Concert Club in Cleveland, OH, the Thompson House in Newport, KY, and Bogart’s in Cincinnati, OH. The band continues to perform in Cincinnati, Louisville, and nearby regions regularly. In the winter of 2014, the band prepared to record and produce its first studio EP, "Liar", during which, the band solidified its identity and musical style. Over the summer of 2016, the band released their second EP, "Wish,". Both EP's are available at digital outlets everywhere. We will talk to Blindside Drop about their upcoming schedule, get a behind the scenes look at their music, feature their latest songs, and ask them to share their message for the troops. Please be sure to visit Blindside Drop at http://www.blindsidedrop.com/ and spread the word. Fans are welcome to call in and speak live with them during the show (718) 766-4193. And as always we will give shout outs to our deployed military listeners. Our message to the troops: WE do what we do, because YOU do what you do.